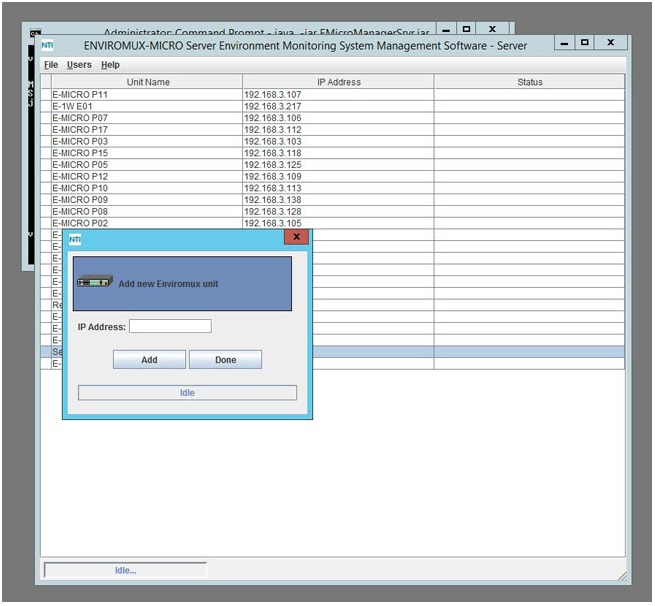 Optional Management Software for E-MICRO-T, E-MICRO-TRHP, and E-1W. 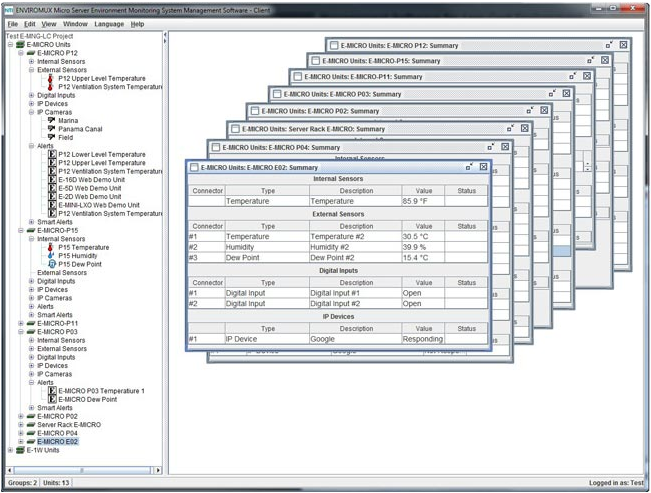 Intuitive graphical management software provides an easy-to-use, unified interface for both monitoring and configuring up to 3,000 E-MICRO-T, E-MICRO-TRHP, and E-1W units and all connected sensors via Ethernet. Units may be monitored and configured individually or in a group. Changes can be pushed to all units in a group at once. 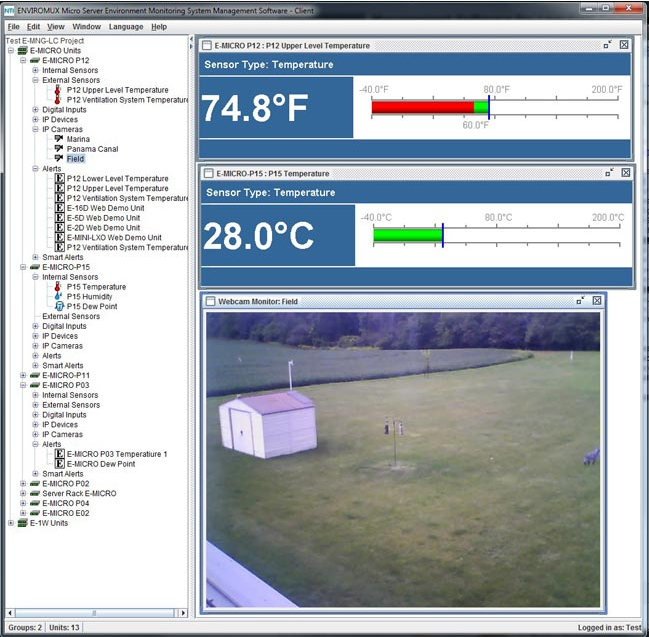 Display values and status for individual sensors or list of sensors. 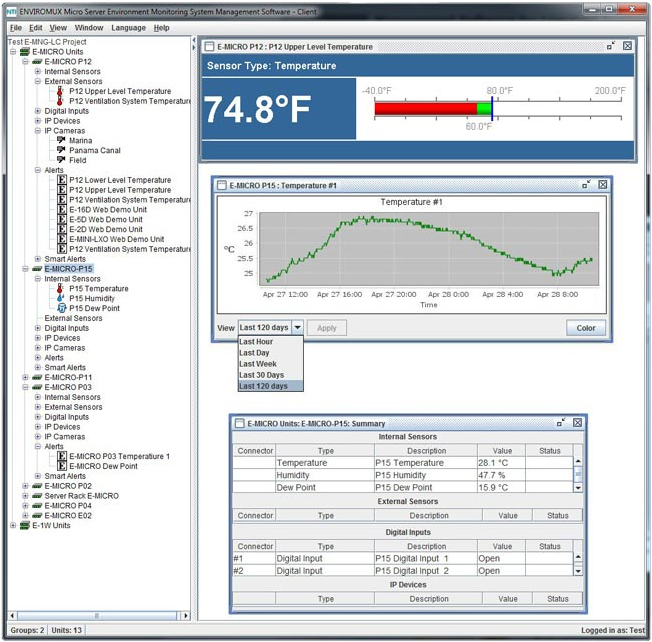 Scrolling sensor summary pages can include selected sensors from a specific unit, all units, or a pre-configured group of units. Filter specific sensors from multiple units for close monitoring. Sensor history graph shows readings from up to the last 120 days. Server application actively polls all units for status information as well as listen for alerts from all units. Client application communicates with the server to read statuses and to deploy configuration changes. Multiplatform support: Windows XP/Vista/7/8/10, Windows Server 2000/2003/2008/2012, Solaris, Linux, FreeBSD, and MAC OS 9/10. Requires Java Runtime Environment 1.7 or later. NTI will provide customer, without charge, copies of any appropriate updates/enhancements for 12 months. This software update service is optionally extendable every twelve months for 20% of list price. 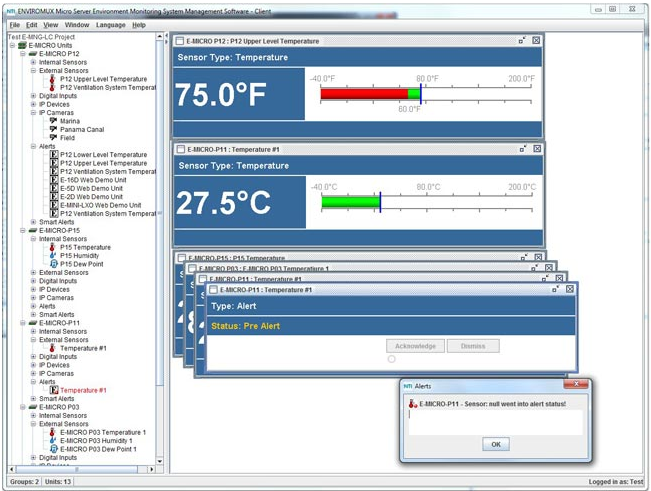 How to monitor and configure up to 3,000 ENVIROMUX-MICRO-T, ENVIROMUX-MICRO-TRHP, and ENVIROMUX-1W (Coming Soon) units and all connected sensors.